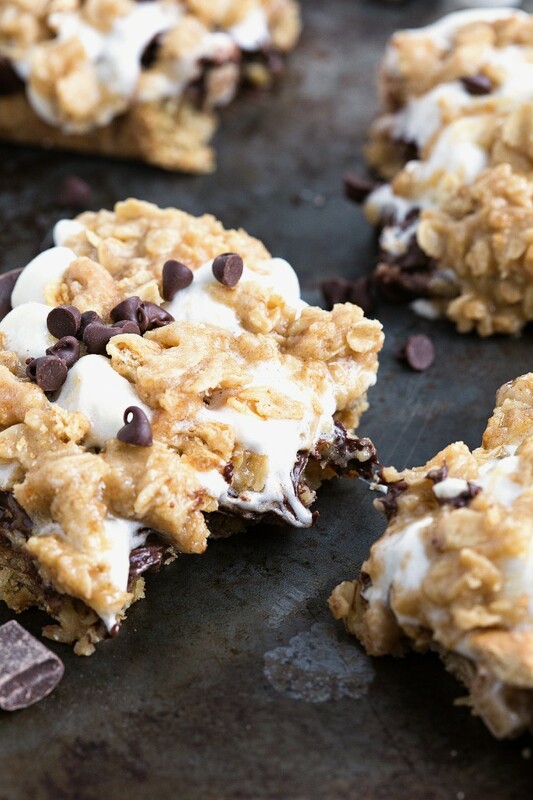 Gooey marshmallow-filled, chocolate-layered, graham-cracker crumb coated oatmeal cookie bars. So did you all notice the whole new-and-improved site? I’ve been dying in anticipation for it to go live because I love it so much. But enough about design since you are probably here about the food. And oh.my.gosh. do I have a dessert for you! This is officially my favorite S’mores dessert ever. Truly, my absolute favorite. 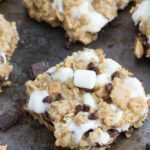 I’m such a sucker for melty chocolate, gooey marshmallows, and oatmeal cookies – of course this would be my favorite. When I was brainstorming for S’mores week, I wanted to make some kind of S’mores gooey bars. When I started to create and think more about the idea, it kind of morphed from one of my favorite desserts on this site – cookie butter oatmeal bars. I took the base from that recipe, changed it a bit, and then added lots of marshmallows and chocolate for the center. More oatmeal cookie pieces on top makes for the perfect finishing touch. These bars are also SO quick to make. 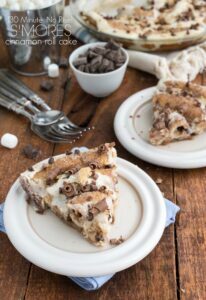 Faster than making a batch of oatmeal cookies and waiting for the dough to chill… And don’t be intimidated by the layers – it’s just one layer of the cookie dough, then chocolate chips sprinkled on top, then marshmallows, and finally the remaining cookie dough on top. 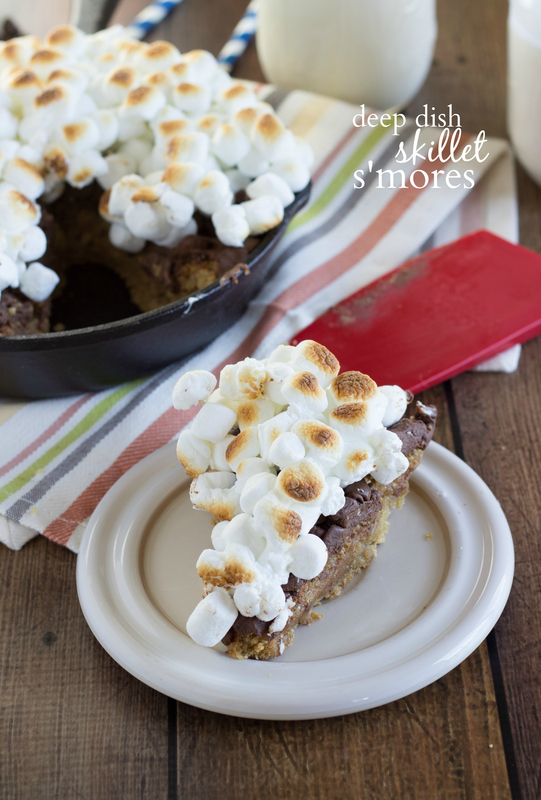 SO easy, SO delicious, and S’MORES!! In a small bowl, combine all of the ingredients for the base layer. Stir until a crumbly type of dough has been formed. Press this "dough" into the bottom of an 8 x 8 baking pan. Cook for 10 minutes or until lightly browned on top and remove from the oven. Sprinkle the chocolate chips on top to melt. Sprinkle the marshmallows on top of the chocolate chips. Beat together the brown sugar and butter until light and creamy. Stir in the oats, coarsely crushed graham crackers, and flour. Scoop the dough (with a cookie scoop) over the marshmallow layer. The dough doesn't cover it completely, but will cook together somewhat. Just evenly disperse scoops of dough on top of the marshmallows and briefly spread out the scoops. Return to the oven for about 5 minutes (it will still be a bit gooey), then remove and allow to cool. These taste great right out of the oven, but take a good hour to fully set. If you don't mind messy bars, then dig in! But I recognized the yummy food! These make me die. And they are inspiring to give my filters one more go, great photos! Pinned! Your design is beautiful, Chelsea! So clean and fresh, definitely fits your site! And I think these might just be the best oatmeal recipe EVER! 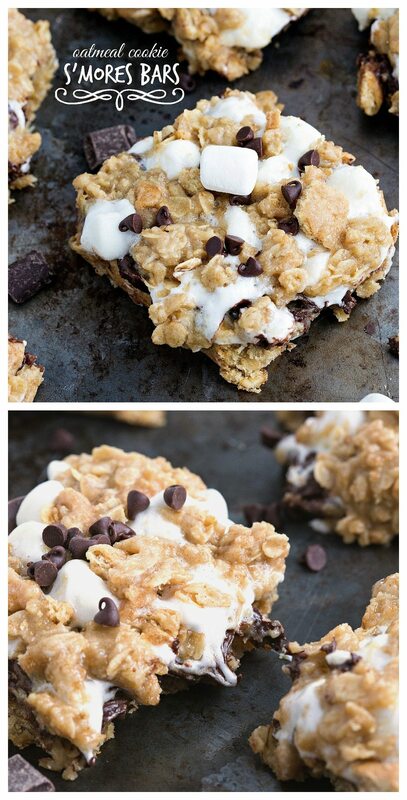 What a fabulous idea to make them into gooey bars. I love how the marshmallow-y goodness going on here. Pinned! I love the new site design! It’s beautiful! And these bars! OMG! 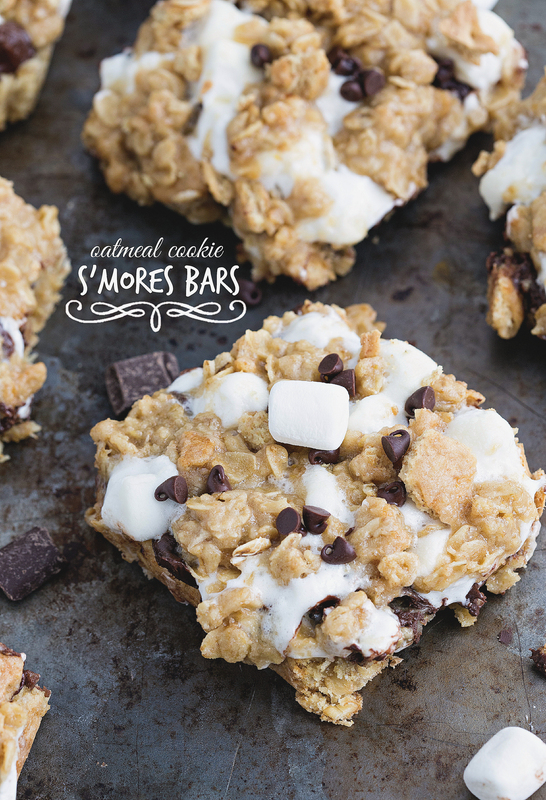 They are so gooey with just the right amount of oats! Pinned! Girlfriend, I dub you Queen of creative desserts! Your creativity amazes me! I wish I had that knack for desserts! And LOVE the new site! It looks awesome!! Love the new site layout and these AMAZING s’mores bars! Chelsea, that moving picture is AWESOME!! and so are these bars, obviously. Ok, you totally sold me by saying that these are your absolute favorite s’mores dessert ever!! So creative to use oatmeal. I was always one to reach for any dessert with oatmeal in it!! Pinned for sure, thanks lovely! I love the site it looks INCREDIBLE!!! and the recipe looks AMAZING!!! Love the new design and these S’mores gooey bars!! Such a fabulous combination, need to make these! I have really enjoyed all these s’mores week posts. Wish I could taste every single one of them! And I absolutely love your new blog design, Chelsea. 🙂 These bars look so good with that gooey marshmallow. Mmmm. 🙂 Pinned! The website looks wonderful Chelsea, love it! 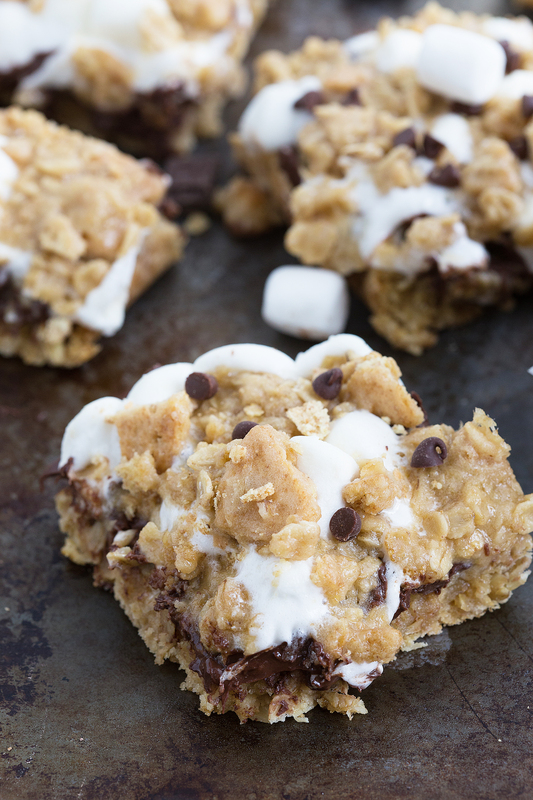 I’m also loving these oatmeal cookie s’mores gooey bars, all the goo has me drooling and wishing I had a pan right now! Pinning. Congrats on the new site design – love it! LOVE the new look! it is gorgeous, and the bars look equally as good! Oatmeal cookie and s’mores combined??? Girl these are awesome!! I LOVE the new site design! SO pretty and perfect and you! and girl…you made a bomb gif. I’m jealous. These bars are so insanely gooey and s’mores-y (new adjective) and just I want to eat an entire pan by myself. so yeah. These look super yummy! I love the new design too! 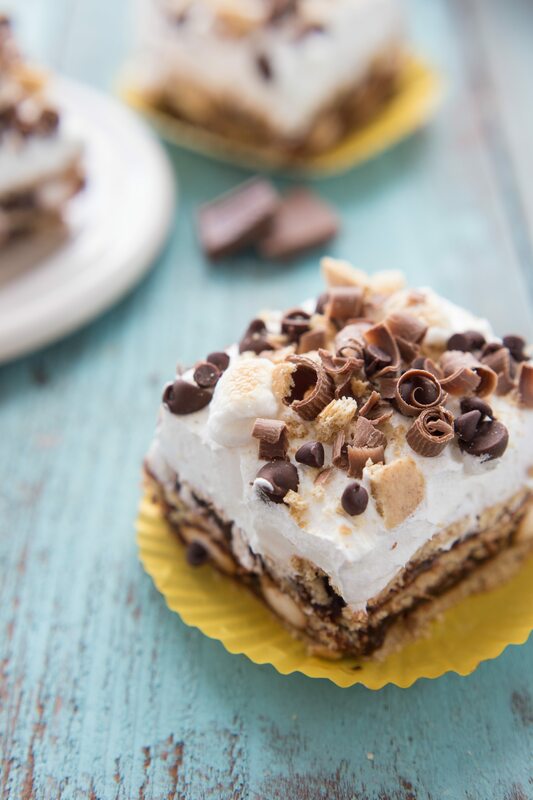 i am seeing too many delicious smores recipes of late and these bars are no exception! i am SO craving one right now..
Love love love these s’mores bars!! I wish I had one to stuff my face with right now! 🙂 And yes, I adore the cute whisks everywhere!! Can I double the recipe and put in 9×13 pan? Hi Rach! I haven’t tried it, but I don’t see why that wouldn’t work. You will just need to watch the baking times and adjust for a larger pan! I made these bars this weekend and they are SOOOOOOOO GOOD!!! I had to add a few minutes in the oven (4 minutes first time in the oven, 6 minutes second time in the oven) because my oven runs cooler than it’s supposed to. But other than that, I followed the recipe exactly and they were perfect. My fiance, who doesn’t like S’mores, begrudgingly took a bite because I forced him, but then proclaimed that the bars were delicious. My father stated that the bars were the best thing he’s tasted in a long time. Thank you so much for the recipe! Thank you SO much Sarah for taking the time to review these and I so appreciate all your kind words! Glad you fiance liked them – haha my husband was the same 🙂 He says he doesn’t really like s’mores desserts but loved these! Making these tomorrow morning, to take & share with friends at dinner. And a great way to use up the leftover s’mores ingredients from camping this summer! Thanks for the recipe! I agree with Chelsea – my favorite S’mores dessert ever! I followed instructions exactly, and they turned out perfect. I refrigerated them after they cooled to make them easier to cut into bars. This one is a keeper. Just fantastic. Yay! So great to hear they are your favorite S’mores dessert!! Still my favorite too 🙂 Thanks for the tip about putting them in the fridge for easier slicing! And thanks for the kind comment! Hi! I’m just wondering what will happen if I sub in peanut butter instead of regular butter, then cut out sugar completely. I’ve made s’mores bars without sugar, but I used butter at that time. If I use peanut butter and a little milk, will the cookie part taste like peanut butter? I’m sorry to not be of more help, but as I haven’t tried any of those swaps in this particular recipe I really couldn’t say if they would work out like you are thinking. I do think they would taste like peanut butter if you used that in place of the butter though. Chelsea!!! oh my gawd, these look so good!!! After last night, you’d think I’d be all “sweets” out . . but I’m not!! Pinned!! I made these tonight and while tasty, the top never formed a “dough” and didn’t bake into the other layers. I followed the recipe exactly. Any thoughts? The top doesn’t really bake into the layers – it’s definitely it’s own layer that tends to mesh with the marshmallows as they get melted. I’ve never had any problems with it not baking all the way in all the times I’ve made these, so I’m not quite sure what’s going on. Did the bottom layer bake for you or was that not all the way baked either? Because that may suggest a cooler oven? Perhaps a few more minutes in the oven could bake it a little more. However, you’ll want to be careful that you don’t overcook it because the marshmallows will not be great. can this recipe be doubled for a 9×13 pan? These look delicious! I wanted to make them ahead to bring camping this weekend. Do they keep for a couple of days? Would I have to keep them refrigerated or is room temperature okay? They actually aren’t the best after a couple of days or so just because of the marshmallow layer (gets hard and blah tasting). If you do make them ahead wrap them SUPER tightly and room temperature is fine as long as it’s not too hot they will be great 🙂 ENJOY! Been making these for nearly 3 years, always a 10 from everyone. I call it Death by Bob, hope that’s ok, Chelsea the real mvp. Really is the best. Haha!! This comment made my day! I’m so happy to hear it’s a hit and I love your name for it 🙂 Thanks Bob! I don’t see why not, but I haven’t ever tried it myself.